Have you ever tried to find a dentist on Saturday night? It is all but impossible. If you’ve got a dental emergency, what might have been an inconvenience can escalate into something much worse. Most dentists are the owners and operators of their practices, so they run them like most other businesses – that is, Monday through Friday, nine to five. It’s a different story with doctors. Medical emergency? Hospitals never close. You can always find an urgent care center or the ER, when there’s a crisis in the middle of the night. And that is what makes OnCall Dental in Fresno such a valuable resource. We there for you 24/7, providing the dental care you need, when you need it the most. We can provide everything from toothache relief to teeth cleaning. And if you’re one of the millions of Americans coping with dental anxiety, we provide sedation dentistry to get you through your procedure. OnCall Dental in Fresno is open seven days a week, providing emergency dental care. Walk-ins are always welcome, and we accept most PPO insurance plans. The condition of your teeth significantly impacts your quality of life. Fillings and root canals are costly and inconvenient. If the teeth can’t be saved, tooth extraction causes more physical and psychological pain. Extraction is usually followed by bone recession. While dentures are preferable to having no teeth at all, they come with a host of troubles. They irritate gums and make breathing, eating, and talking difficult. Dentures are not a one-and-done solution for missing teeth, requiring relines as the jaw shrinks. There is hope! Dental implant technology improves the quality of life for patients with traditional dentures. Implants help slow down declining oral health caused by tooth loss. OnCall Dental-Fresno can help. In addition to providing emergency dentistry services, we also offer restorative procedures and general treatment. 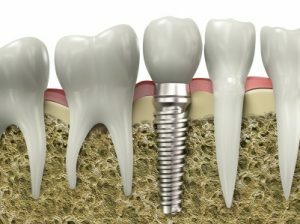 Dental implants are used to replace several teeth and/or anchor over-dentures. Mini dental implants (also called denture-stabilization implants) allow your dentist to securely attach an appliance so that it won’t slip or irritate gums. Small titanium posts planted into the jawbone fuse with the surrounding bone, creating a stable base for an over-denture. Some denture-wearing patients retain only ten percent of their chewing ability. Implant-supported dentures stops bone recession and restore near-normal chewing ability. This results in better nutrition and overall physical health. The psychological benefits are equally valuable. Free of embarrassing denture-slipping, our patients are happier and more confident about their smile. Before you spend money on another denture reline, ask us about denture-stabilization implants. Contact us today for a consultation.